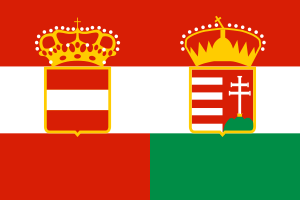 Austria-Hungary (German: Österreich-Ungarn; Hungarian: Ausztria-Magyarország; Czech: Rakousko-Uhersko; Slovak: Rakúsko-Uhorsko; Polish: Austro-Węgry; Croatian: Austro-Ugarska; Italian: Austria-Ungheria), also known by other names and often referred to as the Austro-Hungarian Empire in English-language sources, was a constitutional union of the Austrian Empire (the kingdoms and lands represented in the Imperial Council, or Cisleithania) and the Kingdom of Hungary (Lands of the Crown of Saint Stephen or Transleithania) that existed from 1867 to 1918, when it collapsed as a result of defeat in World War I. The union was a result of the Austro-Hungarian Compromise of 1867 and came into existence on 30 March 1867, when the compromise was ratified by the Hungarian parliament. 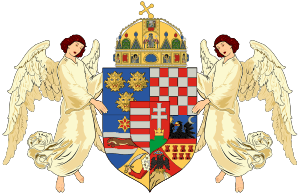 Austria-Hungary consisted of two monarchies (Austria and Hungary), and one autonomous region: the Kingdom of Croatia-Slavonia under the Hungarian crown, which negotiated the Croatian–Hungarian Settlement (Nagodba) in 1868. 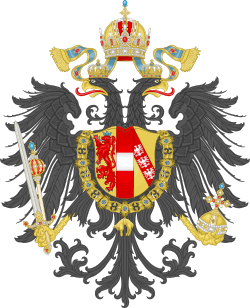 It was ruled by the House of Habsburg, and constituted the last phase in the constitutional evolution of the Habsburg Monarchy. 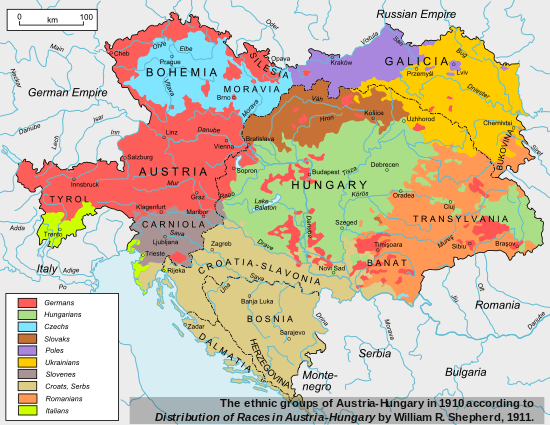 Following the 1867 reforms, the Austrian and the Hungarian states were co-equal. 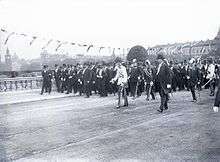 The Compromise required regular renewal, as did the customs union between the two components of the union. Foreign affairs and the military came under joint oversight, but all other governmental faculties were divided between respective states. 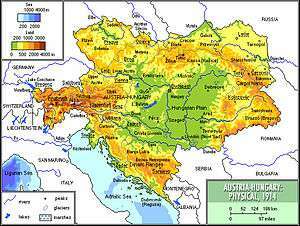 Austria-Hungary was a multinational state and one of the world's great powers at the time. 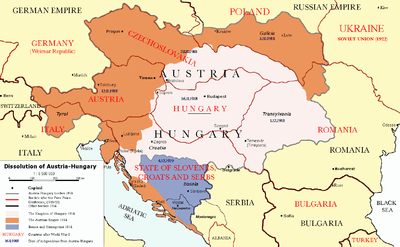 Austria-Hungary was geographically the second-largest country in Europe after the Russian Empire, at 621,538 km2 (239,977 sq mi), and the third-most populous (after Russia and the German Empire). The Empire built up the fourth-largest machine building industry of the world, after the United States, Germany, and the United Kingdom of Great Britain and Ireland. Austria-Hungary also became the world's third largest manufacturer and exporter of electric home appliances, electric industrial appliances and power generation apparatuses for power plants, after the United States and the German Empire. 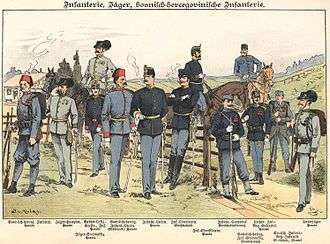 After 1878, Bosnia and Herzegovina was under Austro-Hungarian military and civilian rule until it was fully annexed in 1908, provoking the Bosnian crisis among the other powers. Sandžak/Raška, de jure northern part of the Ottoman Sanjak of Novi Pazar, was also under de facto joint occupation during that period but the Austro-Hungarian army withdrew as part of their annexation of Bosnia. The annexation of Bosnia also led to Islam being recognized as an official state religion due to Bosnia's Muslim population. 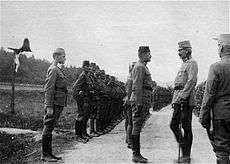 Austria-Hungary was one of the Central Powers in World War I. 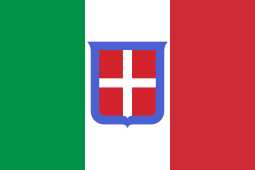 It was already effectively dissolved by the time the military authorities signed the armistice of Villa Giusti on November 3, 1918. The Kingdom of Hungary and the First Austrian Republic were treated as its successors de jure, whereas the independence of the West Slavs and South Slavs of the Empire as the First Czechoslovak Republic, the Second Polish Republic and the Kingdom of Yugoslavia, respectively, and most of the territorial demands of the Kingdom of Romania were also recognized by the victorious powers in 1920. Certain regions, such as Polish Galicia within Cisleithania and Croatia within Hungary, enjoyed autonomous status, each with its own unique governmental structures (see: Polish Autonomy in Galicia and Croatian–Hungarian Settlement). 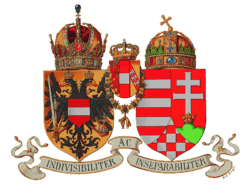 The division between Austria and Hungary was so marked that there was no common citizenship: one was either an Austrian citizen or a Hungarian citizen, never both. This also meant that there were always separate Austrian and Hungarian passports, never a common one. However, neither Austrian nor Hungarian passports were used in the Kingdom of Croatia-Slavonia-Dalmatia. Instead, the Kingdom issued its own passports which were written in Croatian and French and displayed the coat of arms of the Kingdom of Croatia-Slavonia-Dalmatia on them. It is not known what kind of passports were used in Bosnia-Hercegovina, which was a condominium of both Austria and Hungary. K. u. 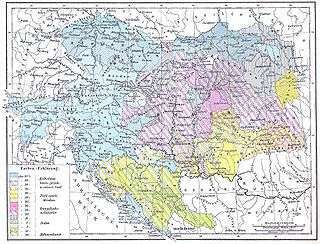 (königlich-ungarisch) or M. k. (Magyar királyi) ("Royal Hungarian") referred to Transleithania, the lands of the Hungarian crown. 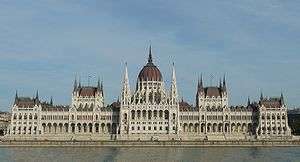 Hungary and Austria maintained separate parliaments each with its own prime minister. Linking/co-ordinating the two parliaments fell to a government under the monarch. In this sense Austria-Hungary remained under an authoritarian government, as the Emperor-King appointed both Austrian and Hungarian Prime ministers along with their respective cabinets. In the Hungarian half, the King-appointed Government was responsible only to the Parliament instead of the King, which gave Hungary a great amount of autonomy, especially in internal matters, yet even in this arrangement the Monarch had many prerogatives such as the right of Royal Assent before any kind of Bill would be presented to the National Assembly (the common name for the Hungarian Diet), the right to Veto all legislation passed by the National Assembly, and the power to dissolve the Assembly and call to new elections. 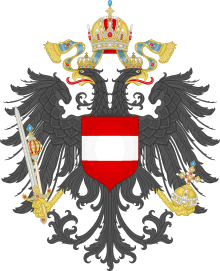 In the Austrian half, however, the Monarchs's power was even greater, as the Emperor had the power to both appoint and dismiss its Prime minister and cabinet members. The monarch's common government, in which its ministers were appointed by the Monarch and responsible to him, had the responsibility for the army, for the navy, for foreign policy, and for the customs union. the county courts with collegiate judgeships (76 in number); to these were attached 15 jury courts for press offences. These were courts of first instance. Royal Tables (12 in number), which were courts of second instance, established at Budapest, Debrecen, Győr, Kassa, Kolozsvár, Marosvásárhely, Nagyvárad, Pécs, Pressburg, Szeged, Temesvár and Zagreb. The Royal Supreme Court at Budapest, and the Supreme Court of Justice, or Table of Septemvirs, at Zagreb, which were the highest judicial authorities. There were also a special commercial court at Budapest, a naval court at Fiume, and special army courts. The organization of the administrative system in the Austrian Empire was complicated by the fact that between the State and the purely local communal administration there intruded yet a third element, grounded in history, the territories (Lander). The State administration comprised all affairs having relation to rights, duties and interests " which are common to all territories"; all other administrative tasks were left to the territories. Finally, the communes had self-government within their own sphere. 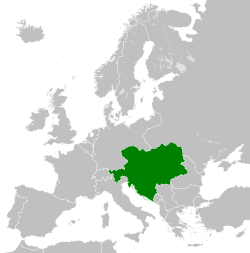 The "Austro-Hungarian Compromise of 1867" created the semi-independent states of Hungary and Austria linked by personal union under a common monarch. The Hungarian majority asserted more of their identity within the Kingdom of Hungary. The nationalism of German speakers prevalent in the Empire of Austria created tension between ethnic Germans and ethnic Czechs. In addition, the emergence of national identity in the newly independent Romania and Serbia also contributed to ethnic issues in the empire. In recognition that he reigned in a multi-ethnic country, Emperor Franz Joseph spoke (and used) German, Hungarian and Czech fluently, and Polish and Italian to some degree. The first Hungarian hydrogen filled experimental ballons were built by István Szabik and József Domin in 1784. The first Hungarian designed and produced airplane (powered by inline engine) was flown in 1909 at Rákosmező. The earliest Hungarian radial engine powered airplane was built in 1913. Between 1913 and 1918, the Hungarian aircraft industry began developing. The 3 greatest: UFAG Hungarian Aircraft Factory (1914), Hungarian General Aircraft Factory (1916), Hungarian Lloyd Aircraft, Engine Factory at Aszód (1916), and Marta in Arad (1914). During the WW I, fighter planes, bombers and reconnaissance planes were produced in these factories. The most important aeroengine factories were Weiss Manfred Works, GANZ Works, and Hungarian Automobile Joint-stock Company Arad. The first Hungarian steam locomotive railway line was opened on 15 July 1846 between Pest and Vác. In 1890 most large Hungarian private railway companies were nationalized as a consequence of the poor management of private companies, except the strong Austrian-owned Kaschau-Oderberg Railway (KsOd) and the Austrian-Hungarian Southern Railway (SB/DV). They also joined the zone tariff system of the MÁV (Hungarian State Railways). 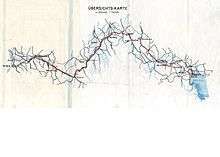 By 1910, the total length of the rail networks of Hungarian Kingdom reached 22,869 km (14,210 mi), the Hungarian network linked more than 1,490 settlements. Nearly half of the empire's railways were built in Hungary, thus the railroad density there became higher than that of Cisleithania. This has ranked Hungarian railways the 6th most dense in the world (ahead of countries as Germany or France). Horse-drawn tramways appeared in the first half of the 19th century. Between the 1850s and 1880s many horse-drawn tramways were built. 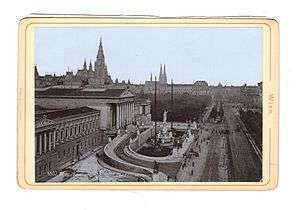 Vienna (1865), Budapest (1866), Brno (1869). Steam trams appeared in the late 1860s. The electrification of tramways started from the late 1880s. The first electrified tramway in Austria-Hungary was built in Budapest in 1887. 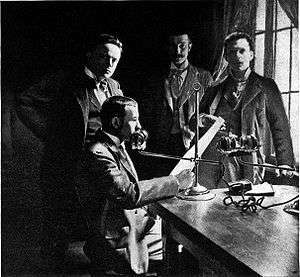 In 1847, the first telegraph connection (Vienna – Brno – Prague) started operation. The first telegraph station on Hungarian territory was opened in December 1847 in Pressburg/ Pozsony /Bratislava/. In 1848, – during the Hungarian Revolution – another telegraph centre was built in Buda to connect the most important governmental centres. 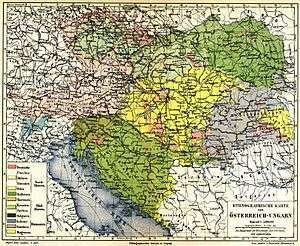 The first telegraph connection between Vienna and Pest – Buda (later Budapest) was constructed in 1850, and Vienna - Zagreb (capital of the Triune Kingdom of Croatia...) in 1850. Austria joined a telegraph union with German states. All telephone exchanges of the cities and towns in Kingdom of Hungary were linked in 1893. By 1914, more than 2000 settlements had telephone exchange in Kingdom of Hungary. General von Hötzendorf was the Chief of the Austro-Hungarian General Staff. 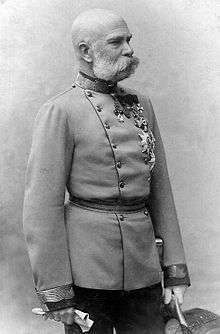 Franz Joseph I, who was much too old to command the army, appointed Archduke Friedrich von Österreich-Teschen as Supreme Army Commander (Armeeoberkommandant), but asked him to give Von Hötzendorf freedom to take any decisions. The latter remained in effective command of the military forces until Emperor Karl I took the supreme command himself in late 1916 and dismissed Conrad von Hötzendorf in 1917. Meanwhile, economic conditions on the homefront deteriorated rapidly. The Empire depended on agriculture, and agriculture depended on the heavy labor of millions of men who are now in the Army. Food production fell, the transportation system became overcrowded, and industrial production could not successfully handle the overwhelming need for munitions. Germany provided a great deal of help, but it was not enough. Furthermore, the political instability of the multiple ethnic groups of Empire now ripped apart any hope for national consensus in support of the war. Increasingly there was a demand for breaking up Empire and setting up autonomous national states based on historic language-based cultures. The new Emperor sought peace terms from the Allies, but his initiatives were vetoed by Italy. across central Europe... The majority lived in a state of advanced misery by the spring of 1918 and conditions would worsen, for the summer of 1918 saw both the drop in food supplied to the levels of the 'turnip winter' and the onset of an influenza pandemic that would kill at least 20 million worldwide. Society was be relieved, exhausted and yearned for peace. Alexander Watson argues that, "The Habsburg regime's doom was sealed when Wilson's response to the note sent two an half weeks earlier arrived on 20 October." Wilson rejected the continuation of the dual monarchy as a negotiable possibility. As one of his Fourteen Points, President Woodrow Wilson demanded that the nationalities of Austria-Hungary have the "freest opportunity to autonomous development". In response, Emperor Karl I agreed to reconvene the Imperial Parliament in 1917 and allow the creation of a confederation with each national group exercising self-governance. However the leaders of these national groups rejected the idea; they deeply distrusted Vienna and were now determined to get independence. 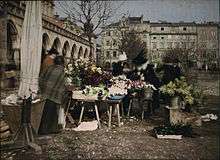 ↑ Citype – Internet – Portal Betriebsges.m.b.H. "Austro-Hungarian Empire k.u.k. 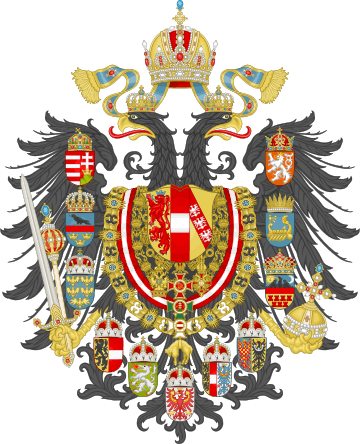 Monarchy dual-monarchic Habsburg Emperors of Austria". Wien-vienna.com. Retrieved 11 September 2011. 1 2 3 "Austria" in the Encyclopædia Britannica, 9th ed., Vol. III. 1878. 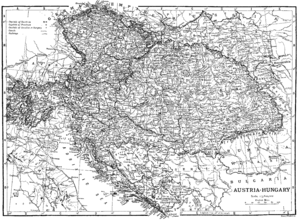 1 2 3 4 5 6 7 8 9 10 "Austria-Hungary" in the Encyclopædia Britannica, 11th ed. 1911. ↑ Publishers' Association, Booksellers Association of Great Britain and Ireland (1930). The Publisher, Volume 133. p. 355. ↑ Contributors: Austria. Österreichische konsularische Vertretungsbehörden im Ausland; Austrian Information Service, New York (1965). Austrian information. p. 17. 1 2 "Bosnia–Herzegovina" in the Encyclopædia Britannica, 11th ed. 1911. ↑ "Imperial Gazette −1912". IGGIO Islamische Glaubensgemeinschaft in Osterreich. 2011. Retrieved 4 June 2014. 1 2 "Who's Who – Emperor Franz Josef I". First World War.com. Archived from the original on 10 May 2009. Retrieved 5 May 2009. ↑ Eric Roman (2009). 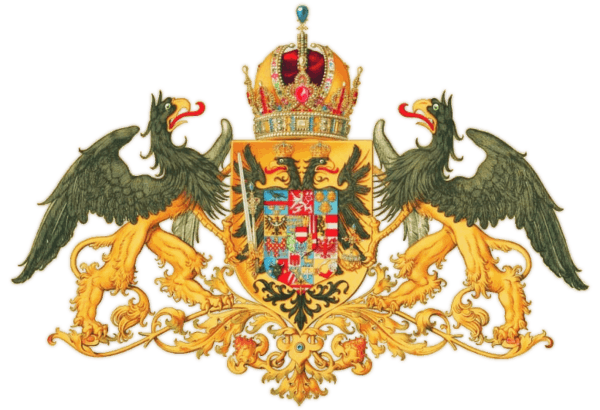 Austria-Hungary and the Successor States: A Reference Guide from the Renaissance to the Present. Infobase Publishing. p. 401. ISBN 9780816074693. Retrieved 1 January 2013. ↑ The New Encyclopædia Britannica. 2003. ISBN 9780852299616. Retrieved 1 January 2013. ↑ Szávai, Ferenc Tibor. "Könyvszemle (Book review): Kozári Monika: A dualista rendszer (1867–1918): Modern magyar politikai rendszerek". Magyar Tudomány (in Hungarian). p. 1542. Retrieved 20 July 2012. ↑ Szávai, Ferenc (2010). Osztrák–magyar külügyi ingatlanok hovatartozása a Monarchia felbomlása után (PDF) (in Hungarian). p. 598. ↑ Flandreau, Marc (April 2006). European Review of Economic History. 10. Cambridge University Press. pp. 3–33. ASIN B00440PZZC. 1361–4916. ↑ "Hungary" in the Encyclopædia Britannica, 11th ed., Vol. XIII, p. 900. 1911. ↑ Gaetano Cavallaro (2010). 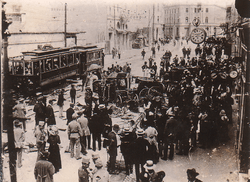 Disaster Ending in Final Victory: The Dissolution of the Austro-Hungarian Empire. Gaetano Cavallaro. p. 201. ↑ Robin D. S. Higham; Dennis E. Showalter (2003). Researching World War I: A Handbook. Greenwood. p. 130. ↑ "Analysis: Austria's troubled history". BBC News. 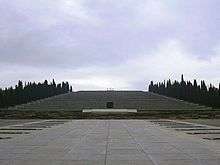 3 February 2000. ↑ Gary B. Cohen (2006). 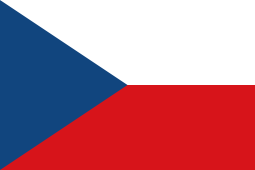 The Politics of Ethnic Survival: Germans in Prague, 1861–1914. Purdue University Press. p. 53. ↑ Aviel Roshwald (2002). Ethnic Nationalism and the Fall of Empires: Central Europe, the Middle East and Russia, 1914–23. Taylor & Francis. p. 116. ↑ "Slovakia – Hungary Relations in the European Union" (PDF). Suedosteuropa-gesellschaft.com. Archived from the original (PDF) on 20 March 2012. Retrieved 19 November 2013. ↑ "Staatsgrundgesetz über die allgemeinen Rechte und Staatsbürger für die im Reichsrate vertretenen Königreiche und Länder (1867)". Verfassungen.de. Retrieved 24 March 2012. ↑ Budisavljević, Srđan, Stvaranje-Države-SHS, Creaton of the state of SHS, Zagreb, 1958, p. 132.-133. ↑ "Hungary – Social Changes". Countrystudies.us. Retrieved 19 November 2013. ↑ Barcsay, Thomas (1991). "Banking in Hungarian Economic Development, 1867–1919" (PDF). Ryeson Polytechnical Institute. p. 216. Archived from the original (PDF) on 17 November 2014. Retrieved 28 August 2016. ↑ Max-Stephan Schulze (1996). Engineering and Economic Growth: The Development of Austria-Hungary's Machine-Building Industry in the Late Nineteenth Century. Frankfurt am Main: Peter Lang. p. 80. ↑ Berend, Iván T. (2013). Case Studies on Modern European Economy: Entrepreneurship, Inventions, and Institutions. Routledge. p. 151. ↑ Max-Stephan Schulze (1996). Engineering and Economic Growth: The Development of Austria-Hungary's Machine-Building Industry in the Late Nineteenth Century. Frankfurt am Main: Peter Lang. p. 295. ↑ "Václav Laurin a Václav Klement" (in Czech). Archived from the original on 1 June 2004. ↑ "The history of the biggest pre-War Hungarian car maker". ↑ "Edvard Rusjan, Pioneer of Slovene Aviation". Republic of Slovenia – Government Communication Office. Retrieved 13 April 2015. ↑ Puskel Péter. "Az aradi autógyártás sikertörténetéből". NyugatiJelen.com. Retrieved 2016-04-09. ↑ "Hipo Hipo – Kálmán Kandó(1869–1931)". Sztnh.gov.hu. 29 January 2004. Retrieved 25 March 2013. ↑ Iván T. Berend (2003). History Derailed: Central and Eastern Europe in the Long Nineteenth Century (in Hungarian). University of California Press. p. 152. ISBN 9780520232990. ↑ "Trams and Tramways in Romania - Timişoara, Arad, Bucharest". beyondtheforest.com. ↑ "The History of BKV, Part 1". Bkv.hu. 22 November 1918. Retrieved 25 March 2013. ↑ UNESCO World Heritage Centre. "UNESCO World Heritage Centre - World Heritage Committee Inscribes 9 New Sites on the World Heritage List". whc.unesco.org. ↑ Žmuc, Irena (2010). "Sustained Interest". In Županek, Bernarda. Emona: Myth and Reality (PDF). Museum and Galleries of Ljubljana; City Museum of Ljubljana. p. 63. ISBN 9789616509206. ↑ "Deutschlandfunk – Essay und Diskurs". Dradio.de. Retrieved 11 September 2011. ↑ Sue Swiggum (3 May 2008). "Unione Austriaca (Austro-Americana) / Cosulich Line". Theshipslist.com. Archived from the original on 1 October 2011. Retrieved 11 September 2011. ↑ "Baron Gautsch". Members.dame.at. 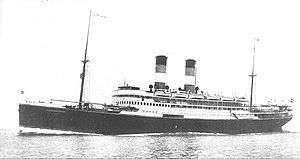 16 June 1908. Retrieved 11 September 2011. ↑ "Österreichischer Lloyd". Aeiou.at. 31 July 2001. Retrieved 11 September 2011. ↑ "Wörthersee Schifffahrt". Archived from the original on 28 March 2009. Retrieved 28 August 2016. ↑ "DDSG Blue Danube GmbH". Ddsg-blue-danube.at. 13 November 2006. Retrieved 11 September 2011. 1 2 "Google Drive – Megtekintő". Docs.google.com. Retrieved 25 March 2013. ↑ "Telegraph Vienna-Zagreb" (in Croatian). Retrieved 11 March 2016. ↑ "Telegráf – Lexikon ::". Kislexikon.hu. Retrieved 25 March 2013. ↑ "125 godina telefonije u Hrvatskoj (125 years of Telephony in Croatia)" (in Croatian). Retrieved 11 March 2016. ↑ Stephen Broadberry; Kevin H. O'Rourke (2010). The Cambridge Economic History of Modern Europe: Volume 2, 1870 to the Present. Cambridge University Press. p. 80. ISBN 9781139489515. ↑ "The Austrian Occupation of Novibazar, 1878-1909". Mtholyoke.edu. Retrieved 2016-04-09. ↑ "CATHOLIC ENCYCLOPEDIA: Austro-Hungarian Monarchy". newadvent.org. 1 2 "Donaumonarchie Österreich-Ungarn". Donaumonarchie.com. Retrieved 19 November 2013. 1 2 3 4 5 6 7 "Britannica". Britannica. Retrieved 24 March 2012. 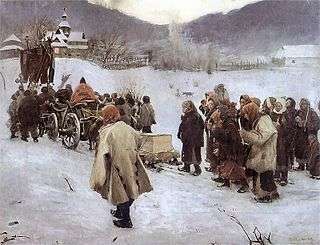 ↑ "The Austrian Occupation of Novibazar, 1878–1909". Mount HolyOak. Retrieved 24 March 2012. ↑ Jeffrey Finestone; Robert K. Massie (1981). The last courts of Europe. Dent. p. 247. ↑ David James Smith (2010). One Morning In Sarajevo. Hachette UK. He was photographed on the way to the station and the photograph has been reproduced many times in books and articles, claiming to depict the arrest of Gavrilo Princip. But there is no photograph of Gavro's arrest – this photograph shows the arrest of Behr. 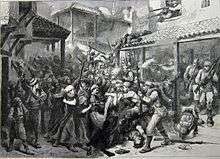 ↑ "European powers maintain focus despite killings in Sarajevo — History.com This Day in History — 6/30/1914". History.com. Retrieved 11 September 2011. ↑ Dimitrije Djordjević; Richard B. Spence (1992). Scholar, patriot, mentor: historical essays in honor of Dimitrije Djordjević. East European Monographs. p. 313. ISBN 9780880332170. 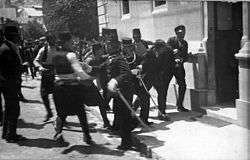 Following the assassination of Franz Ferdinand in June 1914, Catholic Croats and Muslims in Sarajevo joined forces in an anti-Serb pogrom. ↑ Andrej Mitrović (2007). 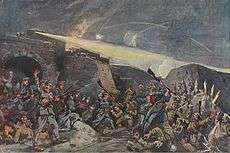 Serbia's Great War, 1914–1918. Purdue University Press. p. 19. ISBN 9781557534774. Retrieved 7 December 2013. ↑ John R. Schindler (2007). Unholy Terror: Bosnia, Al-Qa'ida, and the Rise of Global Jihad. Zenith Imprint. p. 29. ISBN 9781616739645. ↑ Herbert Kröll (28 February 2008). Austrian-Greek encounters over the centuries: history, diplomacy, politics, arts, economics. Studienverlag. p. 55. ISBN 9783706545266. Retrieved 1 September 2013. 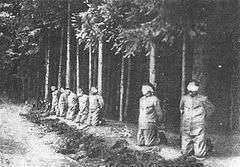 ... arrested and interned some 5.500 prominent Serbs and sentenced to death some 460 persons, a new Schutzkorps, an auxiliary militia, widened the anti-Serb repression. ↑ "First World War.com - Who's Who - Count Istvan Tisza de Boros-Jeno". firstworldwar.com. ↑ Mowat, C.L. (1968). The new cambridge modern history. volume xii. (CUP Archive)London: Cambridge University Press. p. 479. ISBN 0521045517. ↑ Andreas Kappeler (2014). The Russian Empire: A Multi-ethnic History. Routledge. p. 287. ISBN 9781317568100. ↑ Sima M. Cirkovic (2008). The Serbs Volume 10 of The Peoples of Europe. John Wiley & Sons. p. 235. ISBN 9781405142915. ↑ Marius Rotar (2013). History of Modern Cremation in Romania. Cambridge Scholars Publishing. p. 24. ISBN 9781443845427. ↑ Stephen Broadberry; Kevin H. O'Rourke (2010). The Cambridge Economic History of Modern Europe: Volume 2, 1870 to the Present. Cambridge University Press. p. 70. ISBN 9781139489515. ↑ David Stevenson (2011). With Our Backs to the Wall: Victory and Defeat in 1918. Harvard University Press. p. 399. ISBN 9780674063198. ↑ "French forces occupy Corfu — History.com This Day in History — 1/11/1916". History.com. Retrieved 11 September 2011. ↑ "Hungarian foreign ministers from 1848 to our days". Mfa.gov.hu. Archived from the original on 4 December 2013. Retrieved 28 August 2016. ↑ "Trianon, Treaty of". The Columbia Encyclopedia. 2012. Archived from the original on 28 December 2008. Retrieved 28 August 2016. ↑ Tucker, Spencer; Priscilla Mary Roberts (2005). Encyclopedia of World War I (1 ed.). ABC-CLIO. p. 1183. ISBN 9781851094202. Virtually the entire population of what remained of Hungary regarded the Treaty of Trianon as manifestly unfair, and agitation for revision began immediately.